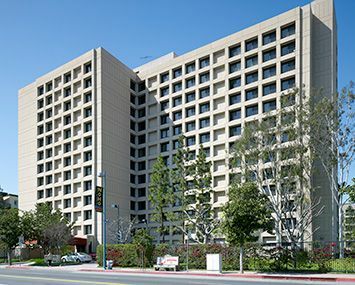 Magnolia Towers is a thirteen story 200-unit secure apartment community nestled in the heart of the North Hollywood Arts District of North Hollywood, CA. Our cooperative community offers retirement living at its best. We are just minutes away from the Avenue of the Stars, the Hollywood Bowl and Burbank. We boast of being neighbors to the Television Academy of the Arts and Sciences and Universal City. Additionally we are conveniently located for the bus transit system and within walking distance to the new metro subway line, as well as shopping. Magnolia Towers Co-op Apartments does not allow smoking in any common areas, and within 25 feet of the building. Magnolia Towers is a great place to live because of its security and resident involvement in building operations. The apartments offer great views and our patio/courtyard offers serenity any time of day. Activities include Bingo, exercise, computer center, billiard room and parties and potlucks for special occasions. You will love our home as much as we do! Magnolia Towers Co-op was also nationally recognized as “A Community of Quality” by the National Affordable Housing Management Association in 2011. Magnolia Towers Co-op is proud to be recognized as a NAHMA Communities of Quality Corporate Partner. This designation is for multifamily properties that have achieved a high standard of excellence in the way they are managed, the services they provide residents, the experience and training of personnel, and other criteria.